If I were only allowed one thing to eat/drink for the rest of my life, it would be chai lattes. It’s an incredibly rare day that I don’t have one, and most days I have two or three. To be technical, what I make are actually chai-flavored steamers. A proper latte would be brewed chai tea mixed with milk. These are chai-flavored syrup added to milk. And actually, since the only thing I love more than chai is chai-nog, I use half chai syrup and half eggnog syrup. To make these low carb (and low calorie), I use almond milk and sugar free syrup. A huge mug, around 16 oz, is only 60 calories. Where else are you going to find something that’s warm, satisfying, filling (hurrah for fat and protein in almond milk), and tastes like all your happy memories for only 60 calories? In addition to the guilt-free version, I also make a version with cream, and another with both cream and coconut oil. If you’re in the mood for something a little decadent, adding just a tablespoon or two of cream makes it feel more creamy and dessert-like. If you want to experience a truly magnificent texture and flavor explosion, add some cream, and then after the chai is heated, add a spoonful of coconut oil and use a stick blender to blend it until it’s frothy. This will give you the kind of drink you pay $5.50 for at the drive-through coffee shop down the street, and you won’t even have to get out of your PJs to get it. While you can purchase the DaVinci syrups online, they don’t have the best prices. I go to Cash & Carry, a local restaurant supply store, and get them for much cheaper. Look around where you live for where all the coffee shops are getting their supplies, and you’ll probably find some. Put everything in a microwave safe mug big enough to hold it. 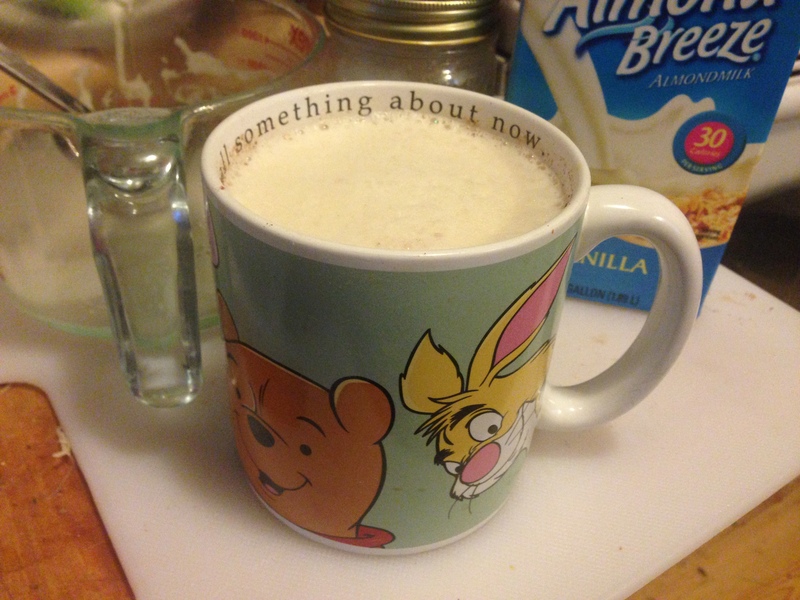 If you don’t have one, you can heat it in a Pyrex measuring cup and pour it into a larger mug when it’s hot. Heat on full power in the microwave for 3-4 minutes. If it develops a skin on top, you’ve probably heated it just a bit too long, but you can just stir it and it will be fine. Heat and serve exactly the way the guilt-free version is done. Prepare and heat everything but the coconut oil in a 4 C. Pyrex measuring cup. You have to do it in a larger container so that when you blend it, you won’t spray it all over yourself and your kitchen. When the chai is hot, add in 1 tablespoon of coconut oil, and using a stick/immersion blender, blend it for about a 30 seconds to a minute until it’s frothy on top. Pour it into your cup and enjoy. I usually put the bowl of a spoon across the pour spout when I’m pouring the chai into my mug to hold back the froth. Then at the end I let all the froth go and it ends up on top.